The key characteristics that distinguish strong transport safety performers – and low insurance claimers – have been identified. New Australian research highlights a list of safety management practices proven to improve safety performance in the heavy vehicle transport industry. The characteristics also improve business’ bottom line, particularly by reducing insured AND (more importantly) UNINSURED costs associated with a crash. Have managers who show leadership in making safety a clear priority. The research also came up with some surprising findings. For example, companies accredited under the National Heavy Vehicle Accreditation Scheme for fatigue management had higher insurance claims and more fatigue policies and training than better performers. Companies with in-vehicle monitoring systems (IVMS) also tended to be higher insurance claimers, perhaps because IVMS-generated data was used for business purposes rather than safety. The research was in response to the heavy vehicle transport sector being over-represented in vehicle crashes. Its findings can be implemented by transport companies – and their insurers – to improve risk assessment and risk management processes. 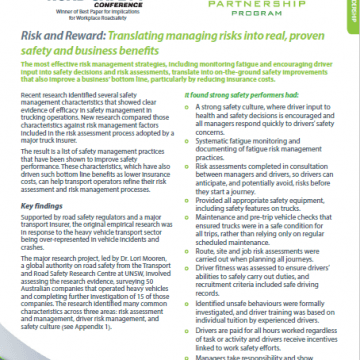 The full list of effective transport risk management strategies is available via the Thought Leadership: Risk and Reward – Translating managing risks into real, proven safety and business benefits . NRSPP will be holding a free webinar with the researcher and its sponsor in March. Your comments to this blog are welcome below and will assist in guiding webinar content.